A view of the mug depicting Lord Hill on horseback with his sword drawn. General Lord Rowland Hill, 1st Viscount Hill of Almaraz GCB, GCH (11 August 1772 - 10 December 1842) served in the Napoleonic Wars as a trusted brigade, division and corps commander under the command of the Duke of Wellington. He became Commander-in-Chief of the British Army in 1829. Another view of the mug revealing the pattern designed to surround the cameos of the two historic figures. The print includes flags, a sword, a rifle, a cannon and a drum. 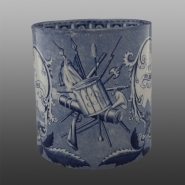 The drum bears the initials "GR" which stand for George Rex. An earthenware commemorative mug with molded handle. 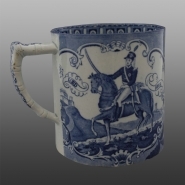 Printed on this side of the mug is Field Marshal Arthur Wellesley, 1st Duke of Wellington, seen mounted on his horse with sword drawn. The Duke of Wellington participated in some sixty battles throughout his military career, most famously restoring peace to Europe at the battle of Waterloo in 1815. He was Prime Minister from 1828-1830 and served briefly in 1834.